Let's examine the opening hour and a half of the emini Dow from Tuesday's session. As seen in the charts below, the session commenced with a sequence of trades where I was out of sync with the bias of the market. And then another when I was completely in tune with the market. Ok, so the sequence where I was out of sync still resulted in a small profit. That's cool. I'm certainly not complaining. But the fact is that there is potential for significant damage to an account balance if you don't quickly recognise and adapt to this "out of sync" issue. In the past, I'd usually take several losses out of a sequence like this, typically trying to fade the move two or three times before giving up in frustration. So, there are some lessons to be learnt. First though… what exactly was going on that resulted in me being out of sync with the bias? 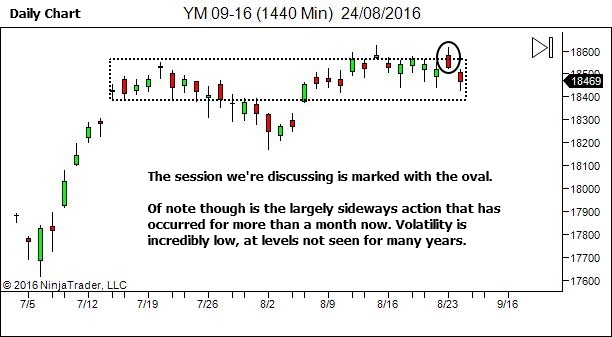 Let's start with the daily and 30 minute charts, in order to get some context. "Trade what you see, not what you think"
What this means is… since I can see the the market is moving higher with a BULLISH bias then I should trade from the LONG direction. It doesn't matter at all what I think the market should be doing. Trade what I see. And yes, normally that is not a problem. I'm usually ok with dropping my expectations and trading in accordance with the market bias. But not this day. The feeling was too strong. And although I was able to enter LONG on two really good signals, I just wasn't able to hold. The trades were scratched for small profits. As a discretionary trader, you WILL have trade sequences in which you're completely out of sync with the market movement. It's a fact! This internal feeling of unease WILL act as an input to your decision making. 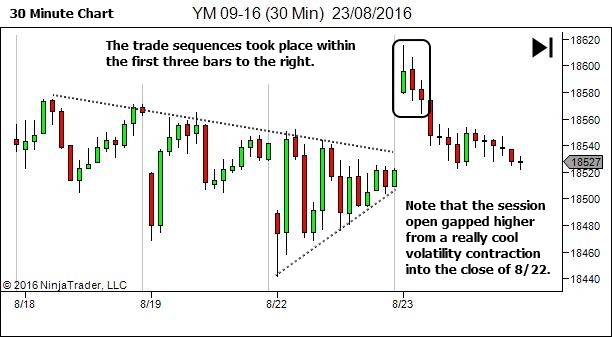 And it will influence both entry and trade management decisions. Your job is to learn to recognise this as quickly as possible. 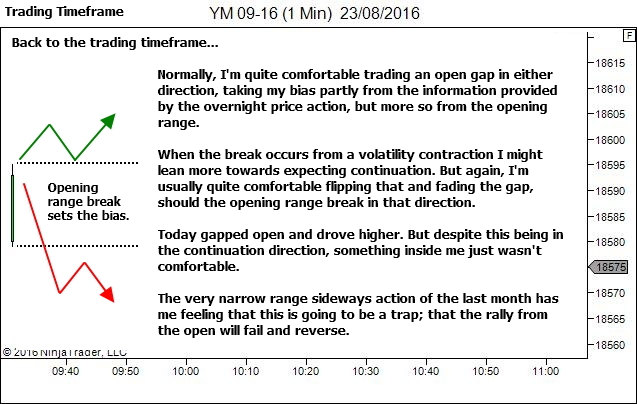 And if you can't shift to the correct bias then take immediate action to mitigate the risk. Otherwise… you may find yourself quickly on the way to your session drawdown limit. Set a trigger to catch yourself as soon as possible, when you do find yourself fighting the market. After two poor trades… pause and reassess. Is your gut feeling about market direction causing you problems? If so, take action to limit the risk. Reduce position size for all further trades. 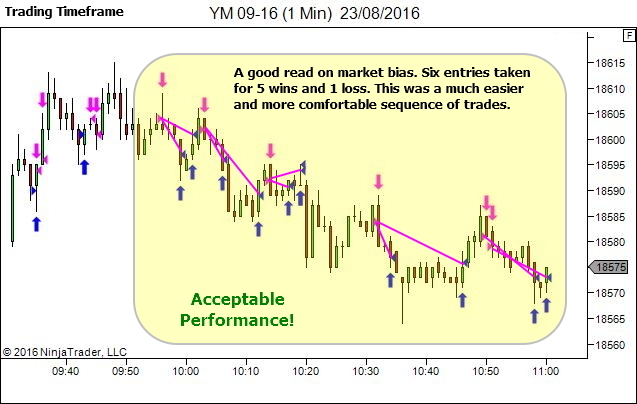 Limit trade direction to the with-trend direction only, and adopt a passive hands-off trade management style. Set the trade and walk away. Or… best of all… just stand aside and wait for something easier. You don't have to trade every day. There is always more opportunity coming along in future. You should aim to stack the odds as much as possible in your favour. A MASSIVE part of that is having a good read on market bias. 1. 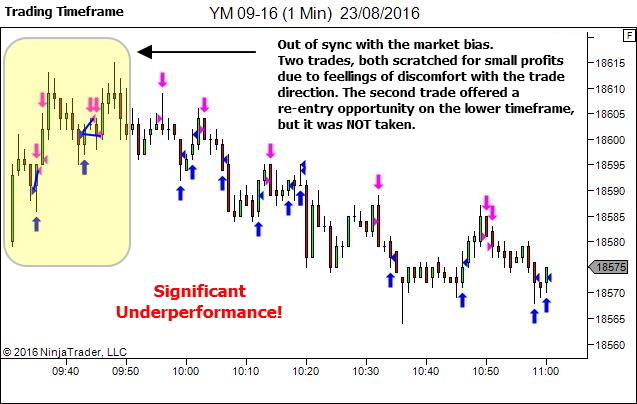 Take note of any price sequences which resulted in multiple attempts to trade the market from the wrong side. 2. Review the conditions – market structure, price action and human performance factors – which may have influenced your decision making. 4. Over time, you'll start to identify those conditions which have the potential to put you out of step with the market, allowing you to recognise and adapt more quickly in future. I greatly enjoyed this article. Thank you.